All of the below information comes directly from job reviews written by Nuclear Graduates employees based on 28 reviews. The UK’s nuclear industry is facing its biggest challenge in decades. Power stations at the end of their life are being decommissioned whilst the Government has given the go ahead for a fleet of new nuclear power stations as part of the UK’s future energy mix. With the need for a geological facility to house legacy nuclear waste and the continual development and maintenance of nuclear propulsion submarines for the Ministry of Defence there is no shortage of unique challenging roles for graduate engineers and scientists joining the industry. 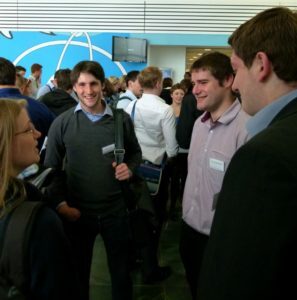 The nucleargraduates programme is one of the most ambitious ever put together. 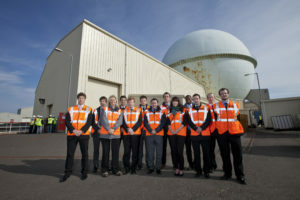 A formidable partnership of companies have worked together to create it with graduates joining the programme sponsored by one of the industry’s leading organisations – Sellafield Ltd, Rolls-Royce, Magnox Ltd, the Nuclear Decommissioning Authority, Office for Nuclear Regulation and the Environment Agency amongst others. The scheme is also involved with more than 20 other industry stakeholders. 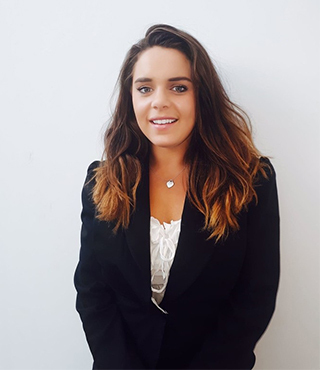 This two year programme allows you to choose and complete three placements; you can expect to find yourself working onsite, with the private sector supply chain, regulatory authorities and with Government. There is also the possibility of going on an international placement. You will develop your technical skills through structured training chosen for you with the aid of a mentor to support you towards charted status with your chosen institute. 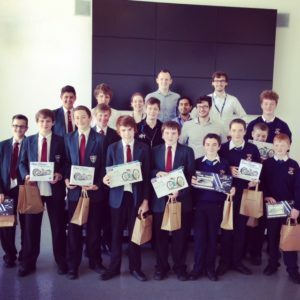 Our Footprints corporate social responsibility programme will allow you to gain an understanding of the political and commercial factors which affect our industry, become a STEM ambassador to help excite the next generation of scientists and engineers and develop a small business to appreciate the challenges our supply chain face. As an engineer or scientist you’ll be crucial within the industry. You’ll have the chance to make progress with onsite decommissioning work at Sellafield, shape industrial strategy with the NDA or research new commercial reactor designs with Rolls-Royce. Needless to say you’ll get a wealth of technical experience and the opportunity to try out more commercial activities. Upon completion of the two year programme you will start employment with your chosen sponsoring organisation to continue your career and professional development. nucleargraduates are looking for individuals who can influence people through their attitude and actions, helping effect change across the industry without compromising its excellent safety record. Mobility, adaptability and tenacity are critical for our graduates. We are looking for people who can achieve real results while showing humility as an individual and in a team environment. International travel, meeting interesting people. Good work/life balance. Huge range of opportunities and flexibility with work. You can make whatever you want of the scheme. Opportunities to work internationally and move company to company. Great opportunity to travel with assigned budgets for secondments. The ability to work at different companies in very different roles over two years. The work is incredibly interesting (my sponsor company is Rolls-Royce). Also the development opportunities are great. I like the emphasis on training- it's good to know that my development is important. Multiple secondments allow you to gain a lot of industry experience in a short space of time. Opportunity to gain experience that permeates entire industry in terms of appreciation of supply chain, regulators, customers, operators, etc. I enjoy the variety of work that I get to take part in. I like not being on one project for long periods of time. I have been able to take on smaller tasks as part of a wider project and feel a sense of achievement when I have completed them. Great work environment and opportunity to travel. The huge amount of training and support on offer, the quality of the programme team and the training events they run. The ability to go abroad for a secondment if you want. Exposure to the industry and the ability to work across it very early in my career. Strong 'community' feel with the 40 people in your cohort. The huge range of opportunities for different work secondments, training options and life experiences. Knowing that I can spend the next year and a half figuring out what I want in my longer term career. As Nuclear Decommissioning Authority sponsored graduate, I am not obligated to go back to any specific organization - where I go at the end of the scheme is completely up to me. Variability and networking. There are a lot of opportunities in the scheme and no graduate has the same path so you feel like an individual with power over your future. Opportunity to experience multiple jobs across the industry. 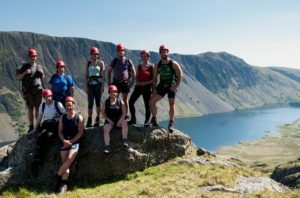 Additionally to make a huge network of contacts and undertake a well planned and beneficial training programme which puts you in a fantastic place to secure well paid long term roles following the scheme. Flexibility and the huge range of things to work on. It's a really tough day so can feel like you've messed up but stay positive. Think about the value you added in a project or job. Prepare for the unexpected. Be polite, enthusiastic and succinct. Really great programme with an abundance of opportunities to progress in the field of nuclear. Try to be outgoing, open to increases in responsibility and focus on working well in a team. Research the industry and the prospective role a little. Be honest but sell yourself. Don't get too stressed about not performing so great during one of the assessment day exercises. Focus on the next one. Competency based questions. Basic nuclear science questions (depending on the role). Be enthusiastic about the role and the industry. Don't be too overbearing in the group interviews. They like to be a bit different just try not to let their application process throw you. It's the obvious one but be yourself, they're looking to see if your personality fits with the scheme which is more important with this job than most others. It's best for everyone if you don't pretend to be someone you aren't. The interviewers are looking to see what makes you unique from a personal standpoint. it's not all about technical brilliance. Try to refer to specific projects you have taken part in at organisations and the skills employed whilst performing your role. Demonstrating a strong technical background would also be beneficial to most roles. Identify some core workplace skills you possess, and how you have utilised these to benefit projects or overcome obstacles in the past. The interview will not solely be a technical discussion; though this will be an essential part of it. Be prepared to work in teams and under supervision during exercises. To make the most of the opportunities provided to you on this scheme you have to be a very driven person who is willing to set goals and acheive them. Teamwork and leadership are equally valued. It is important that you can demonstrate both of these qualities at the assessment centre. Encourage quiet group members to contirbute to discussions / seek out their opinions. Be a well rounded candidate. It's not all about knowing everything. Act yourself and be a team player. Make sure you're committed to moving potentially to the other end of the country for the best opportunities, you won't enjoy it if you can't be flexible. Make sure you have done some fairly extensive research on the nuclear industry. They don't expect you to be an expert but you'll need to know something to show you want to work in the industry and to set yourself out a bit. It's quite long and intense. Don't act differently to how you would do in a real situation, they want to see how you act and behave for a reason. (e.g. multiple secondments and potentially moving around the country over the two years), make sure that comes across. And if not, the scheme may not be for you. The interview is a two day long assessment centre including multiple group tasks, interviews and role play. Prepare for a technical presentation, technical interview, and behavioural interview. Prior experience in the nuclear industry isn't necessary, but make sure you have done your research on the industry as a whole - you will be asked about what you know. Be enthusiastic about the nuclear industry and understand the history and future of the industry. You can apply to multiple jobs on the scheme but you will be invited for interview for one at a time. The interviews are 2 days long and are exhausting! Get up to speed on the industry and how your subject relates to it. They're looking for good team workers, communicators etc but remember it's about the quality of what you say, not the quantity. Look at the website and other documentation. Understand the specific skills they are looking for and how what you have done at university and otherwise meets these criteria. The assessment centre is always going to be an unfamiliar scenario. Try as best you can to relax and behave as you would in any other working situation. The assessors will be able to see your full potential if you are being honest, truthful and acting as you see fit and not how you expect to be acting. Read up on the scheme, the companies who sponsor graduates and the industry as a whole. You don't need to be a nuclear boffin to get a job, but doing some research goes a long way in showing your interest in the sector. Often the roles here are for extroverted people and those with potential for leadership and good people skills. This is all on top of being the cream academically speaking. Be yourself, it's better not to get on the scheme than to get on being somebody you are not. Include all your additional experience outside of your degree as this is what sets you apart. Properly research the nuclear industry beforehand if you don't have prior experience. I was asked to give a presentation- Make sure to prepare well for this! Before doing the presentation make sure to gauge who your audience is. You may be explaining a very technical concept to someone who is in a commercial role who knows little on the subject. Ability to move around internationally. Poor graduate scheme team, lack of communication, unfocused training, inability to handle criticism. Poor pay. Treated like schoolchildren, not adults. Opportunities and flexibility. Very personal approach- they care about your development. Lots of travelling (can be a positive too!). The spectrum of opportunities that myself and other nucleargrads get to experience. Management from a remote location. The employer, Energus, are all based in West Cumbria and while day to day management can come from your secondment line manager in the various organisations, our overall manager does not get to see our progress, development and have oversight of issues as clearly. This can lead to discrepancies in work evaluations or decision making processes. Support from ENERGUS is great. They also put on many training zones to help professional development. Excellent support from nucleargraduates programme team. Strong support network, training opportunities, reputation within industry for producing exceptional graduates. Relatively small, not known as well Internationally. The company offer you a budget for CPD opportunities. Within reason it is left up to you how you wish to spend this budget and develop yourself. Processes and schemes implemented to drive improvements are becoming a box ticking exercise. For example appraisals which should be used to encourage improvement and recognise achievements are all about scoring in the moment - no forward planning and development plans come out of this process. Would like more project work at times, having short secondments doesn't give you a really involved role. They offer an incredible amount of training, with complete freedom over your own CPD budget. Communications can be a little confusing at times. The graduates have a huge support network that we can depend on if needed. A lot of time needs to be committed to the scheme which can sometimes be challenging - but we knew it would be challenging when we signed up for it. Plus we get out what we put in! Can be bureaucratic and inefficient. The amount of opportunities given for training and learning. Graduates often aren't listened to.